As the final stage of the editorial process, proofreading often feels like an afterthought. It’s sort of a joke in the publishing industry that everyone wants to be an editor; a few people aspire specifically to copyediting, but I’ve never heard anyone say they want to be a proofreader. Even the publishing program at Portland State, which has a robust editorial track, tends to gloss over proofreading. But proofreading is more than a superlight copyedit—it’s an integral stage in a book’s development that requires its own special skill set. Copyeditors work on an author’s manuscript and are concerned with imposing mechanical consistency; correcting infelicities of grammar, usage, and diction; and querying internal inconsistencies of fact or tone. Proofreaders, in contrast, are charged with correcting errors introduced during the typesetting, formatting, or file conversion of the final document and with identifying any serious errors that were not caught during copyediting. 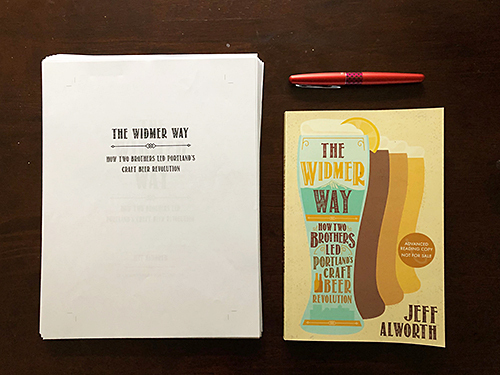 Ooligan’s editorial department just finished up proofreading The Widmer Way , and as I attempted to explain the goals and expectations that accompany a proofread, I began to realize just how involved proofreading is. Runts and stacks may seem minor in the grand scheme of things—nobody is going to put a book down because of a quirk of typesetting—but proofreaders, as the last line of defense before a book goes to print, walk a uniquely fine line. By the time a manuscript arrives to the proofreader, it’s past the stage where the text can be substantially changed; proofreaders, in addition to flagging typesetting issues, must decide if an error, whether grammatical or factual, is minor enough or major enough to warrant changing. A missing comma is a minor change and can be suggested without a second thought; an easily verifiable factual error is a more difficult call. Proofreading is also one of the last realms of publishing that takes place on paper rather than electronically (except at Ooligan, which uses a rather complicated system involving Google Sheets). Those mysterious markings and symbols that proofreaders use to communicate with designers and typesetters are important for any proofreader to know, and although the symbols themselves are easily found online and in the Chicago Manual of Style , the intricacies of how to use them is not always as intuitive. Even though proofreading tends to be the lowest-paid of the editorial stages (at least per the Editorial Freelancers Association’s suggested rates), it’s no less important than developmental editing and copyediting.